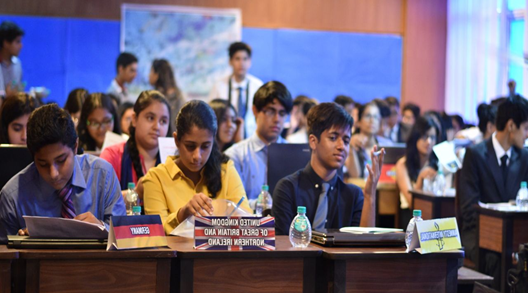 The Day 2 of the KRMUN 2K17 was organised on 15 July, 2017 at K.R Mangalam World School, G.K-II. The students took up innumerable issues such as, Eurozone Crisis, Proliferation of Nuclear weapons, use of mercenaries, socio economic issues, 1971 Bangladesh Crisis. The following committees are being seen in action like the SVR, NSG, UNHRC, IDA, JCC and UNSC. It was indeed fascinating to see various committees at work. One could find the first timers as well as the most experienced ones in the committees. On entering the rooms, delegates were found arguing, working and drawing inferences for the attention of the Chairs. Many delegates cleared their doubts by continuously shooting questions at the Executive Board which were answered to their content. The committees also broke into three breaks to join their work henceforth. The committees revolved around their agendas which were solved to some extent.